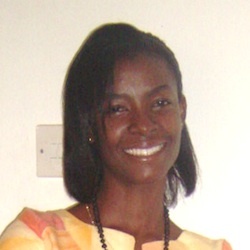 Abigail Oteng-Yeboah joined Edify Ghana as the Monitoring and Evaluation Officer in September, 2014. Prior to this, she worked as the Monitoring and Evaluation Manager for Community Empowerment Associates and earlier for Plan Ghana and CARE International Ghana as an Intern and Project Facilitator respectively. Abigail has practical knowledge in organizational assessment, planning, implementation, budgeting, monitoring and evaluation. She has acquired both trans-disciplinary and multi-cultural experiences in development work through her educational and professional practice. These have been gained through her extensive work on education, water and sanitation and health projects. Abigail has skill in working with concepts such as Gender Audit and Social Analysis and Action. Abigail holds a Master’s degree in International Development and Management from Lund University, Sweden and BSc degree in Development Planning from Kwame Nkrumah University of Science and Technology, Ghana.